This site offers you the opportunity to learn more about Southeast Missouri Beef Cattle Improvement Assn., founded in 1975. The programs listed on these pages are all supervised by extension specialists of the University of Missouri. The members of the governing boards are all producers of the cattle enrolled in the programs. The SEMO Performance Tested Bull Sale is committed to selling top quality bulls to increase the value of your calves. Consignors continually offer excellent genetics with many EPDs ranking in the top 10% of the respective breeds. Sales are held the fourth Friday of March and the third or fourth Friday of October. Visit the Bull Sale tab for upcoming sale information, consignment instructions, and past sale results! Thank you to all the buyers and consignors for helping to make this sale a success. If you are interested in consigning bulls or would like more information on the sale please contact Darrell Aufdenberg, sale manager. The Show-Me-Select Replacement Heifer Program is designed to be a reliable source of quality replacement heifers in terms of genetics and management. Producers have followed stringent program requirements for heifer reproductive soundness, immunization protocols, and sire selection. This program is under the supervision of Regional Extension Livestock Speciailists. 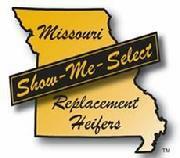 The SEMO Show-Me-Select Heifer Program continually offers 150-250 quality replacement females the first weekend in May and December. Visit the Show-Me-Select tab for program and sale information.